Indymedia: March 2014 will see the first ever Anarchist Bookfair to be held in Sydney. In association with Jura Books and Black Rose, the Sydney Anarchist Bookfair collective is organising this non-profit event at the Addison Road Community Centre and we would like to invite you to have an information or merchandise stall in the main hall. Anarchist Bookfairs began in London over 30 years ago and have since spread across the globe, including Australia’s shores with our comrades in Melbourne now planning their forth annual event. The Anarchist Melbourne Bookfair will be a free event held at Abbotsford Convent (St Heliers Street, Abbotsford) from 10am-6pm on Saturday 10th of August in 2013. The bookfair consists of up to 40 stalls of independent book-sellers and activist groups. Alongside the stalls there will be about 21 one-hour workshops running all day on all kinds of anarchist and direct action topics. There is also a small kids’ space with volunteers to help carers, or for carers to self-organise child minding, or if the kids just want to play indoors. 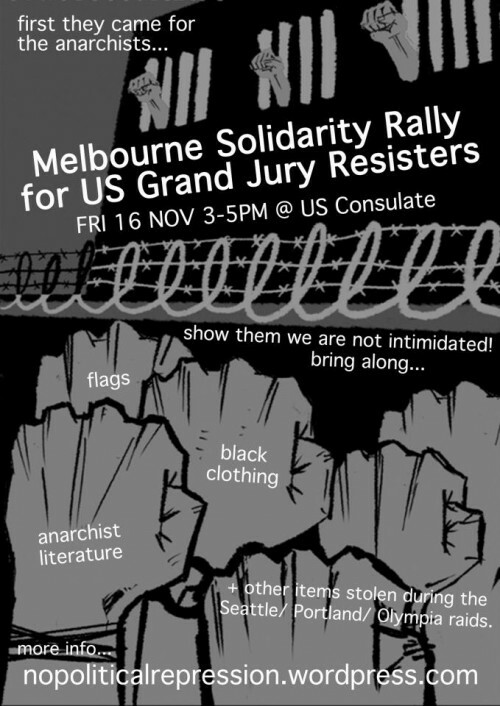 from slackbastard: The week of November–12 November 19 will see solidarity actions with the Grand Jury Resisters in the US and elsewhere. In Melbourne, a rally [Facebook] has been organised to take place on Friday November 16 outside the US Consulate (Level 6, 553 St Kilda Road, Melbourne) at 3pm. Supporters are asked to wear black and to bring their favourite ‘anti-government or anarchist literature’. See : Support Grand Jury Resisters & Committee Against Political Repression. FBI and Joint Terrorism Task Force agents raided multiple activist homes in the Pacific Northwest of the United States. Their warrents authorised them to seize “anti-government or anarchist literature, ” along with flags, flag-making material, cell phones, hard drives, address books, and black clothing. At least four anarchists have since been brought before the Grand Jury. Katherine ‘KteeO’ Olejnik and Matt Duran have refused to testify and been imprisoned as a result, Matt from September 13 and Kteeo from September 27 Their incarceration will likely continue until the Grand Jury dissolves (perhaps another 18 months). Maddy Pfeiffer, who was subpoenaed on October 25, refused to cooperate and was released on a continuance, to appear in front of the grand jury again on December 14th. Leah Plante was imprisoned on October 10 and released about a week later. Mutiny zine for July/August (#66) is now available. Koori Mail: A RALLY is being planned for Sydney tomorrow, to protest the circumstances of a dramatic car chase in Kings Cross early on Saturday morning that saw two pedestrians struck and ended in police shooting two Redfern teenagers. The 14-year-old driver of the stolen car and an 18-year-old passenger remain in hospital. Video footage has emerged of an officer repeatedly punching the heavily bleeding passenger after he was dragged from the car. A police investigation into the incident is underway, amid calls for a separate one into the level of force involved in the arrests. Tomorrow’s rally outside NSW Parliament House will start at 1.30pm.